I don't read and review picture books often, but here goes. This is a children's non-fiction book about the Amazon. 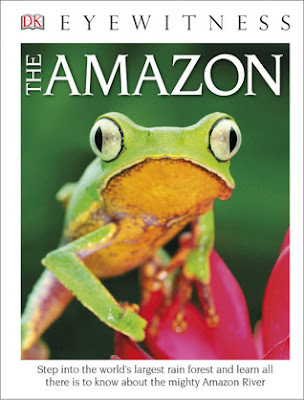 it's full of bright, beautiful photos of the plants, people, and critters of the Amazon rain forest. It touches on a little of the history and myths of the indigenous people and also talks briefly about the Spanish and Portuguese explorers. I liked that it had a fairly large section on the dangers faced by the rain forest today and talked about ways to preserve the forest while still allowing its residents to earn a living. One quick fact that stood out to me was the following: "If crops are grown beneath the trees - a system called agroforestry - an area of the Amazon rain forest can make 42 times more profit than if it were cleared for pasture." Since most people are motivated more by immediate needs and self-interest than they are by long-term preservation, this is the kind of information that might actually help save the rain forest from destruction. I read this book to help research South America for a book I'm trying to write. It was a good overview of the area and helpful in getting a quick feel for the sights and life contained within. I'm not the target audience, but I enjoyed it and would recommend it to anyone interested in a quick peek at the Amazon - not just for children.